The results of the administrative elections express the masses’ opposition to the austerity policies of the Renzi government and its dependency on the decisions of the European Commission and those of Nato. 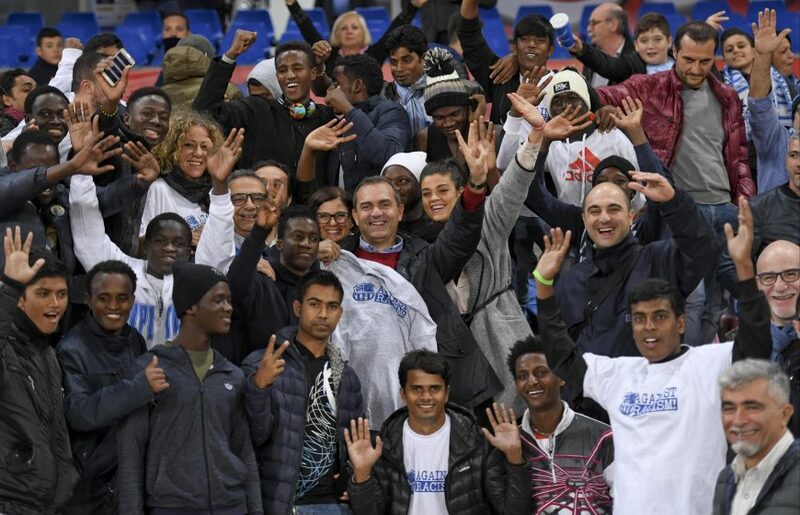 The feature image shows the Mayor of Naples standing among Refugees, on the occasion of a football match. He can be seen in the centre of the picture, holding a white shirt. November 2016. In the Italian cities with a population higher than 15,000, the ballot gave a direct choice for the Mayor, and an indirect choice by voting for one of the parties of the candidate’s coalition. If no candidate receives a majority of votes, the top two candidates go to a second round two weeks later. The coalition of the elected Mayor is guaranteed a majority of seats in the council with the attribution of extra seats. The City Council is elected at the same time as the Mayor. Voters can vote for a list of candidates and can express up to two preferences for candidates on that list. Seats are attributed to parties proportionally. For each Party, the candidates with the highest number of preferences are elected. The M5S is the Movement Five Stars. It was the only organization that ran in all the above elections without forming coalitions. See note at the very end. These local elections can also be called: the ‘administrative’ elections. They were held on 5 June, with a run-off on 19 June where necessary. In some areas, they had already taken place on 8 May, 15 May and 22 May 2016. Municipal councilors and Mayors ordinarily serve a term of five years. Matteo Renzi was born in 1975. He has been the Prime Minister of Italy since February 2014, and Secretary of the Democratic Party (PD) since December 2013. The PD was founded on 14 October 2007 as a merger between centre-left parties. The majority of the PD was formed by the ‘Democrats of the Left’ who had come from the Italian Communist Party; in the PD, these joined forces with the ‘Catholic is Freedom Party’ and elements of the former Christian Democrats. A constitutional referendum is planned for Sunday 4 December 2016. Voters will be asked whether they accept amending the Italian Constitution. This amendment would reform the appointment and powers of the Parliament, and it would affect the repartition of the powers between the State, the regions and various administrations. The Constitutional Bill proposed by Prime Minister Matteo Renzi and his Centre-left ‘Democratic Party’ (PD) is subject to a constitutional referendum. Opposition parties have strongly criticized this Bill. In their view, it will grant too much power to the government and the Executive. The results in these local elections of May-June 2016 have varied depending on towns, parties and coalitions. What they have expressed, however, is the opposition of the masses to the austerity policies of the Renzy government, and its submission to the decisions of the European Commission and Nato. Throughout the European Union (EU), the masses reject the policies of austerity. These policies signify privatisations, cuts in public services and big bailouts for ‘failing’ banks; they also signify growing military budgets and the increased participation of Italy in imperialist wars. Those measures are rejected by the masses. The latter are widely aware, but their consciousness does not find the means to focus. The most recent working class struggles have remained partial, local or sectional in character. At Trade Union and political levels, the leaders did not rise sufficiently to the challenge of the reactionary wave. In these conditions, the government and the Italian CBI (Confindustria) managed to weaken the workers’ movement. The masses have only partial or deferred ways to express their anger. In these administrative elections, more than 40% of the electorate abstained. Those who attracted votes were the M5S movement (Five Stars Movement), and the left which made gains in places like Naples, Bologna and some smaller towns. It is important to note that the right-wing parties lost votes. Their prescriptions did not convince enough people to challenge Berlusconi; and in the middle ground, where the Centrists also lost votes, it was noted that they were amongst those who ‘lost the least’. Further to the right, the fascists of the Liga del Norte and Fratelli di Italia did not win anything important, in spite of their anti-immigration and anti-refugee cries wanting to spread fear, xenophobia and nationalism. In these local (administrative & mayoral) elections, 13 million people were called upon to vote, i.e. 25% of the population. Voting took place in Rome, Naples, Turin, Milan, Bologna and Cagliari. The PD (Partito Democratico) – the Party of Prime Minister Matteo Renzi – lost 2 towns: Rome and Turin. In Rome, the PD always governed through client and mafiosi systems that appropriate the funds set aside for the resettlement of aliens and social services for the poorest. Turin had been regularly ruled by Communists and Socialists since the defeat of fascism after the war; but the local government dabbles in aristocratic circles. It rules in cahoots with the high-flyers of multinationals, of FIAT, of the big banks and high finance. The latter do not even notice that the population is in the grip of misery, particularly in the suburbs. A chasm has developed between the power of an exclusive and arrogant administration, and the life conditions for tens of thousands. Although Renzi is head of the government and of the PD, he took little interest in these elections. These were not over that he was already starting on the Constitutional Referendum with a campaign not even due before October. As the crisis of the European Union was taking central stage in the mind of the masses, these were looking for every way to reject austerity and the monstrous public-debt repayments. In Italy, the towns suffer terribly from the consequences of European policies. The Communal and Regional authorities have no choice but to borrow from banks or on the market, raise taxes and increase privatisations. This does not stop them from failing however, even in their most elementary duties. Huge social fractures have opened up. From one end of one town to another, you can have a 5 years difference in life expectation. The people who took part in the administrative elections did so in a dispersed way. The left currents, the Communists and the important social movements did not channel the immense social rage. The big Trade Union organisations contributed to this disarray too, by not countering the PD government’s measures of social regression. The Unions did not build enough resistance against the Labour Laws which now allow mass sackings with small compensations. The new Pension Law extends the working life by 6 years; it also removes some of the rights previously acquired in the public services, as against the teachers. In May, the pensioners took to the streets of Rome, Naples, Venice and other cities, calling for the review of that law. The anger of people is great, but it is dispersed, as shown by the almost 50% abstentions! The right wing of the Liga Norte and Fratelli d’Italia won some popular votes by accusing the immigrants “who take our Italian jobs”. A fairly large group voted for the Party of Grillo of the M5S (Five Stars movement), but the latter partially achieved this by attacking the rich and ‘the privileged political caste’. Like the right wing, the M5S condemns the European Union. Those most on the right do this in the name of nationalism, whilst the M5S does it more ambiguously. The M5S still attracts left-wing sectors who hope of counter the PD in that way. Previous to these elections, left movements had created Fronts of the Lefts. These stayed autonomous in relation to the PD in order to oppose the government’s programme of privatisations and public services cuts. These Left Fronts reject the rescheduling of the public debt and insist on participative democracy. Rifondazione Comunista (PRC) is part of them, along with Sinistra Ecologica Liberta (SEL) which comes from the latest split in the PRC. These Fronts can include groups of ex-PD deputies (ex-MPs), intellectuals from “The Other Europe” (AET) and others from associative movements. Various Left Fronts presented themselves in several towns, but their success was not so great. They suffer from the keenness of the SEL to make alliances with the PD for the sake of some posts in institutions. In Milan and Cagliari, the SEL made a direct alliance with the PD of Renzi. The forces of the left suffer also from the ‘first past the post’ majority electoral system that encourages ‘the useful vote’. This allows the SEL to keep going in the shadow of the PD. 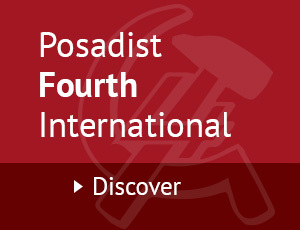 For what regards the Refundazione Comunista – which has been opposing the PD for years – it is does flesh-up its anti-capitalist proposals with enough programme, policy, political functioning and political leadership. However, this is not so much the case in Naples. The Mayor of Naples, 20 November 2016. Five years ago, an important current of the left in Naples was ostracized by the right wing of the PD. At the time, an organised system of criminality within the PD’s centre-left had adulterated the primaries. It is then that the PD’s left – which had included Rifundazione Comunista and an important part of the PD’s base – declared its independence from the PD and supported Luigi de Magistris for Mayor – and he won (in 2011). In June 2016, de Magistris won again, and continued in his post of Mayor as an Independent. In supporting de Magistris, the left of the PD and the Left Front defeated the right-wing PD-SEL alliance. With de Magistris as Mayor, important experiences in participative government are being made. These have allowed advances. The central government of Renzi reacted by declaring open war on Naples, but its Mayor has still found the means to municipalise water distribution. The Naples government is also one of the rare local governments to have implemented the decision – agreed by referendum – to keep water public. It is Naples too that created teams of teachers to provide high standards in the State schools. Naples makes investments beyond the directives of the European Commission. It stops some privatisations by encouraging people to occupy public spaces and buildings. It also helps the good functioning of “participative and communal budgets”. Naples is often described as “the rebellious commune”. Indeed, it was the only municipality in the country to have sent messages of support to the Maduro government, and messages of solidarity to the victims of the US-inspired guarimbas (murderous provocations perpetrated by armed right-wing groups) when these took place in Venezuela in April 2013. Naples is seen as a great force. The left throughout the country applauds the Naples communal government – the SEL included! De Magistris likes to call himself “the Mayor of the Street”. He won by a very large 66.8% in June 2016, leaving 33.15% to his right-wing opponent Lettieri of Forza Italia. Throughout all this, the PD and M5S were not making very significant gains. This experience shows the way to the rest of the country. A constitutional referendum is to be held in Italy on Sunday 4 December 2016. Voters are being asked whether they approve of amending the Italian Constitution; this would increase the power of Parliament and alter the power relations between the State, the regions and the municipalities. It is necessary to vote NO, but by making a clear differentiations between the NO of the right-wing and the NO of the left. From Salvini and Berlusconi to Berdini, they will all vote NO. The experience of the Left Front of Naples must be extended to the whole country. This entails coordinating the struggles of all the associative movements, the cooperatives and the solidarity committees with the Refugees. 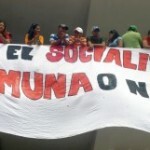 Those sectors must join forces with political movements for social transformations. They need the fullest participation of the citizens to oppose decisively the policies coming down from Brussels; public investments are needed in the public services, under the control of the workers and users. The Stability Pact must go. It subordinates the local governments to the European directives. In the actual facts, these directives are class directives: they cannot be defeated with superior levels of management. They demand anti-capitalist measures. As the strangling of Greece shows, only anti-capitalist measures can defeat those European policies. Notes on the M5S – the Five Stars Movement. The growth of the M5S is not the same throughout Italy. It only got big votes in 2 towns: Rome, where it is boosted by PD discredit and right wing crisis, and in Turin where Chiara Appendino (Grillo’s supporter) only won in June because the PD decided to back her up in the second round. M5S is led by comedian Grillo whose public face is almost entirely on-line. His private networks are those of the Group Casaleggio Asociati. There is no organised contact between those who subscribe to the M5S, and the organisation has no physical headquarters. It does not call assemblies either. It has no democratic political life. Decisions are taken through networks that involve thousands, but no-one is in charge of verifying or controlling the results, and all items of volunteered information become the property of the site. The ambiguousness of this structure ‘neither of the right nor of the left’ allows it to operate without a particular programme. It uses slogans like “respect for the law” and “transparency”; and it likes to condemn “the political caste”. Through the M5S, you hear as much of right-wingers wanting to throw-out the immigrants, as of left groups keen to defeat the right-wing PD. The M5S is very unclear about the European Union too. It used to oppose the EU strongly, and its single currency. This enabled alliances in the European Parliament with extreme right-wingers like Nigel Farage (of UKIP). Now that the M5S has an eye on government, it is less critical of the EU. To the opposite of Farage, it did not celebrate the British Brexit. It is no longer so close to UKIP either. It knows that a pure nationalistic policy has no perspectives in Italy. The M5S won in Rome, but a silent war started no more than a few days after the installation of Virginia Raggi in her post: the M5S right wing sector of Di Maio wants to collaborate with the right-wing notables of the Rome local government, whilst Grillo and others prefer agreements with Trade Unions and some left-wing personalities. Luigi de Magistris: Born 1967. In 2011, de Magistris ran for the Mayor of Naples as the candidate of Italy of Values. He won in the second round, defeating the right-wing candidate Gianni Lettieri with 65% of the vote. The Left Front of Naples includes the now independent left of the PD, plus The Italy of Values (IdV), the Federation of the Greens (FdV) and the Party of the South (PdS). The Stability and Growth Pact (SGP) is an agreement between the 16 countries of the European Union who use the Euro as currency. Created in 1997, the SGP imposes legal restrictions of ‘fiscal responsibility’ on each of its member State, to keep the value of the Euro at a fixed rate throughout the zone. Giuseppe Piero ‘Beppe’ Grillo: Born 1948. From actor and comedian, he became politician and blogger. He helped start the Five Star Movement in 2009. Casaleggio Associati was created in 2014 in Milan. It offers on-line consultancy to companies and organisations wishing to raise their on-line profile. Virginia Raggi. Born 1978. She belongs to the M5S. She won the June municipal elections in Rome with 67.5% of the vote against Robert Giachetti of the PD, and thereby became the Mayor of Rome.